Introduction and background. Preload and fluid responsiveness are two different things. In certain situations, like patients with increased intrathoracic pressures, traditional barometric filling pressures (eg central venous pressure and pulmonary artery wedge pressure) are erroneously increased. In those circumstances volumetric preload indices better reflect the true preload conditions of the patient. Fluid management in these patients can be very tricky because early adequate initial resuscitation is mandatory however in order to prevent organ edema and secondary abdominal hypertension one must avoid ongoing futile fluid loading. We will illustrate opposite changes between barometric and volumetric preload indices in a patient with increased intrathoracic pressure. Patients and Methods. The case of a 26-year-old man admitted to the ICU after general seizures described. This case was presented and multiple-choice questions were presented to the delegates via an interactive voting system at the 32nd annual international symposium on intensive care and emergency medicine (ISICEM) in Brussels on March 20th 2012, at the 2nd International Fluid Academy Day (IFAD) in Antwerp on November 17th 2012, and at the 33rd annual ISICEM precongress symposium course on abdominal problems in Brussels on March 18th 2013. Results. In this patient, who developed shock within 18 hours of ICU admission the dynamic evolution is presented. Despite initial normal (and thus adequate) filling pressures, further fluid resuscitation was needed to overcome the ebb phase (this was guided by functional hemodynamic parameters and volumetric preload indices). Diuretics were initiated after 24 hours to help the patient to transgress to the flow phase because of respiratory failure due to capillary leak as evidenced by increased extravascular lung water. Discussion. This case nicely demonstrates the biphasic clinical course from ebb to flow during shock as well as the inability of traditional filling pressures to guide us through these different phases. It also illustrates and provides answers to the four basic but crucial questions that need to be solved in order to avoid harm: 1) when do I start giving fluids, 2) when do I stop giving fluids, 3) when do I start fluid removal, and finally 4) when do I stop fluid removal? Preload and fluid responsiveness are two different things [1-3]. In certain situations like patients with increased intrathoracic pressure (ITP) related to increased intra-abdominal pressure (IAP) or the use of high positive end expiratory pressures (PEEP) during lung protective ventilation, traditional barometric filling pressures like the central venous pressure (CVP) or pulmonary artery wedge pressure (PAWP) are erroneously increased [4, 5]. In those circumstances, volumetric preload indices like global end diastolic volume index (GEDVI) obtained with transpulmonary thermodilution, right ventricular end diastolic volume index (RVEDVI) obtained via Swan-Ganz pulmonary artery catheter (PAC) or left ventricle end diastolic area index (LVEDAI) obtained via transthoracic echocardiography better reflect the true preload conditions of the patient. Since increased ITP has an impact on the global ejection fraction (GEF), correction of GEDVI in relation to the GEF may further improve the predictive value of this preload parameter . Fluid management in these patients can be very tricky because early adequate initial resuscitation is mandatory however in order to prevent secondary intra-abdominal hypertension (IAH) one must avoid ongoing futile (crystalloid) fluid loading [7-11]. We will illustrate opposite changes between CVP and GEDVI in a patient with increased ITP related to acute respiratory failure with pulmonary hypertension and a transiently opened foramen ovale . 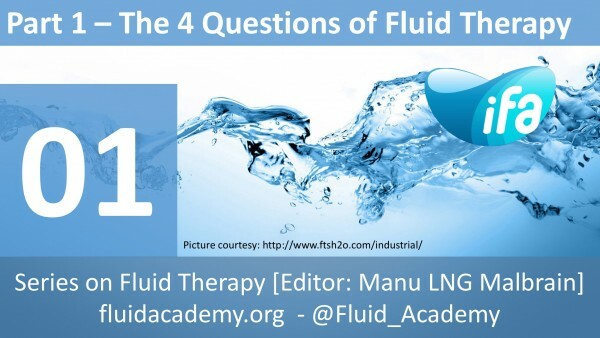 This blog post dealing with “The 4 questions of fluid therapy” is the first in a total series of four, the others being: “The 4 D’s of fluid therapy”, “The 4 indications for fluid therapy”, and finally “The 4 phases of fluid therapy”. If you are interested in fluid therapy in the critically ill please join us for the 6th International Fluid Academy Days, Hilton Congress and Convention Centre, November 23 – 25, 2017. The programme is now online (http://fluidacademy.org/ifad-2017/program.html) and registration (http://fluidacademy.org/ifad-2017/program.html) and abstract submission (http://fluidacademy.org/ifad-2017/abstract-submission.html) are now open. Follow-us on Twitter (@Fluid_Academy, #IFAD2017). What are the risks of fluid overload? When considering fluid therapy and administration 4 basic questions need to be taken into account: 1) it is important to know when to start giving fluids (what are the benefits of fluid administration), 2) when to stop giving fluids (what are the risks of ongoing fluid administration), 3) when to start removing fluids (what are the benefits of fluid removal), 4) and finally, when to stop fluid removal (what are the risks of removing too much fluid). The literature shows that a negative fluid balance increases survival in patients with septic shock . Patients managed with a conservative fluid strategy also seem to have improved lung function, shorter duration of mechanical ventilation and intensive care stay without increasing non-pulmonary organ failure . However, any measurement in the ICU will only be of value as long as it is accurate and reproducible, and no measurement has ever improved survival, only a good protocol can do this. Vice versa a poor treatment algorithm can result in potential harm to the patient . Patients who are in the ebb or flow phase of shock have different clinical presentations and therefore different monitoring needs (targets) and different treatment goals [8, 9]. The case of a 26-year-old man admitted to the ICU after general seizures is presented. This case was presented at the 32nd annual international symposium on intensive care and emergency medicine (ISICEM) in Brussels on March 22nd and at the 2nd International Fluid Academy Day (IFAD) in Antwerp on November 17th, both meetings were held in 2012. Finally, the same case was presented at the 33rd annual ISICEM pre-congress symposium course on abdominal problems in Brussels on March 18th 2013. A 5-item questionnaire was shown electronically to the participants. Each multiple-choice question was shown during the case presentation lecture and participants were allowed to provide their feedback via a voting system (DIF Media). This case report will present the clinical case scenario as well as the results of the voting during both aforementioned meetings. A 26-year-old male is admitted to the intensive care unit with general seizures, syncope, non-palpable blood pressure, and a suspicion of ventricular tachycardia whilst in the Emergency Room. The emergency room physician therefore (successfully) applied a DC shock to convert him to regular sinus rhythm. Afterwards the patient was alert and cooperative and he was transferred to the ICU for mere overnight “baby-sitting”. From his previous history, we know that he has been deprived of oxygen at birth, and consequently suffered a cerebrovascular accident (CVA) with left hemiparesis and seizures (managed with triple antiepileptic therapy, carbamazepine, topiramate and lamotrigine). Because of his cognitive deficit, he normally attends a special day care institution. For the last 9 years he had also been diagnosed with idiopathic cardiomyopathy with a left ventricular ejection fraction (LVEF) of 52% (treated with an angiotensin converting enzyme inhibitor) and a mild mitral regurgitation. Overnight in the ICU, he was initially hemodynamically stable with no further seizures. However, his need for supplemental oxygen increased from 2 liters via nasal cannula to 15 liters administered with a non-rebreathing mask. The patient was in respiratory distress with a respiratory rate of 34 breaths per minute. After failing a trial of non-invasive ventilation, he was intubated and mechanically ventilated within 24 hours of ICU admission, illustrating the dramatic chain of events. Respiratory rate was set at 24 breaths per minute and inspiratory pressures towards a tidal volume of 6ml/kg predicted body weight (PBW). Figure 1. Panel A. shows the chest X-ray on admission and just after intubation (Figure 1. Panel B.). He then became hemodynamically unstable. Therefore, a transthoracic cardiac ultrasound (US) was performed (Figure 2, Video 1 and 2) and the results are listed in Table 1 together with the ventilator settings and blood gas results. Figure 1. Panel B. Chest X-ray after 18 hours, obtained just after endotracheal intubation showing cardiomegaly with vascular crowding and bilateral interstitial infiltrates. Figure 2. Parasternal long axis image obtained during transthoracic cardiac ultrasound showing dilated left ventricle and 3 on 4 mitral regurgitation. Taking into account the results obtained with the transthoracic cardiac ultrasound, what is your treatment of choice at this stage?